Sunday afternoon we went to our local watering hole-Big Chicks for some food and libations (they have a cookout on Sundays with burgers and such) but even more so Vodka Lemondades!!! As always it was great to see friends and hang out with them, and also to meet some new people and oggle and the latest eye candy. A girl was walking around handing out these flyers asking us if we'd come to their Speed Dating event later in the week. 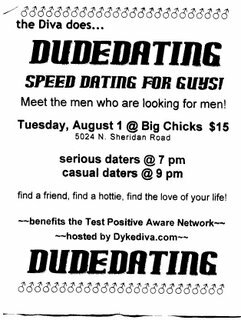 I did one of these Gay Speed Dating things a few years ago - talk about a waste of money - the only people that were interested in me were the ones I was not interested and vice versa - it was very difficult on the ego! I think Speed Dating is a great concept - if you're hot! If you're just a plain jane it's not fun at all. 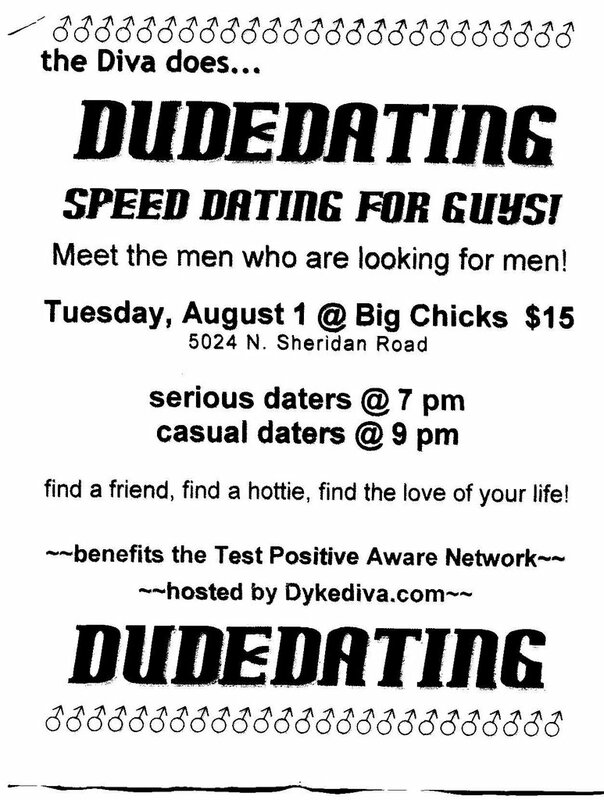 But what I found most interesting about this Speed Dating event was that "Serious Daters" were asked to come at 7:00 and "Casual Daters" at 9:00? I guess they figured that if someone came at 7:00 and wasn't able to meet up with someone within a two hour period those boys who are just looking for a quick trip to the bedroom should be able to fly in and whip through the crowd and take who they want! I wonder how the event went? How many of the "serious daters" ended up as a Casual Dater's conquest? Michael, you're a bit contradicting. By all means, you're hot, nonetheless speed dating didn't work for you. I reckon, there must be flaw in the concept of this speed dating. Gomad - You sure know how to flatter a boy! But what the heck is the thing they tried to do with the "E" in 'dude'?? Do these dudes all have forked toungges or something?? I don't get it.